Poverty, malnutrition, and disease are a fact of life in many parts of Honduras. To make matters worse, healthcare is limited, especially for those who lack financial resources. 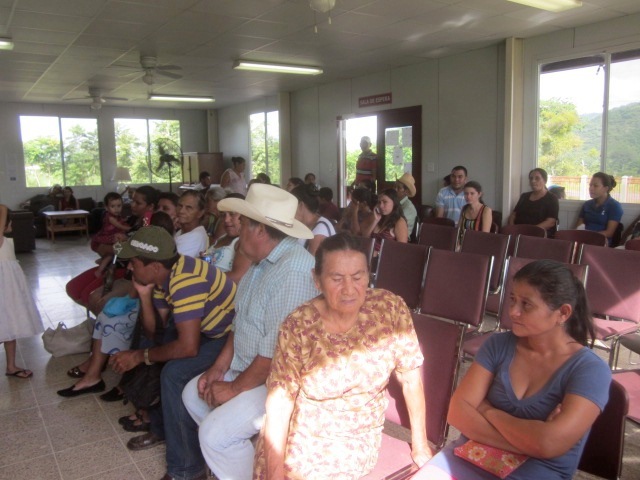 People travel on buses or walk on dirt roads for hours to seek treatment at the Manos Amigas clinic. No one is turned down because they can not pay. Serving at the Crossroads is committed to ensuring the clinic has the necessary equipment, medicine, and supplies needed to treat and care for the patients that walk through the doors. We organize medical and dental brigades from the U.S. who spend one to two weeks at a time augmenting the clinic staff and providing care in specialities such as pediatrics, OBGYN, internal medicine, surgery, audiology, and dental restoration. If a person needs care beyond what can be provided at the clinic, we work through our network of partners in Honduras and the U.S. to find the resources to provide the necessary treatment. Patients walk for hours to seek medical care. . .
are given necessary medication . . .
and are treated with care, concern, and respect (and sometimes even walk away with the doctor's favorite baseball cap!). A team of medical specialists from Highland Presbyterian Church from Lancaster, PA offered services in pediatrics, OBGYN, pulmonology, internal medicine and hearing loss. This boy is smiling at the gift of sound.